Send Me Good Candy, under jockey Ivan Carnero, qualifying out of the final trial on Friday night. OKLAHOMA CITY, OK�APRIL 3, 2015� Friday night racing at Remington Park featured the first 11 of an eventual 22 trials to determine qualifiers for the $827,000 Remington Park Futurity on April 18. First crop sire, the deceased GOOD REASON SA who stood at Royal Vista Ranches, sired qualifier Send Me Good Candy who posted the second fastest time of :16.642 seconds following an impressive 1� winning effort in the final trial for trainer Clinton Crawford. 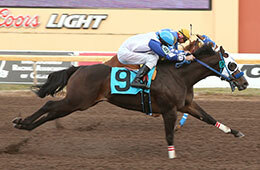 Joe Badilla, Jr., rides Wyld Blue Yonder (#9) to victory in the Remington Park Futurity trials. The homebred racing for the Estate of Carl Pevehouse is out of the Pyc Paint Your Wagon mare Roll On Candy Wagon. Ivan Carnero had the riding assignment. Wyld Blue Yonder, an IVORY JAMES filly from the Royal Quick Dash mare Quick Moon Sign, won the second heat for owner Nicolas Johnson. 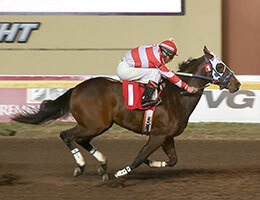 Ridden by jockey Joe Badilla, Jr., Wyld Blue Yonder posted the third fastest clocking of :16.626 seconds. Bobby D. Cox. bred the $43,000 Heritage Place Yearling Sale graduate. For the five finalists from Friday night heading to the Remington Park Futurity on April 18, with their times, sires, dams, owners, breeders, trainers and jockeys CLICK HERE. Jockey Joe Badilla posted three victories Friday. The hat trick came aboard Wyld Bleu Yonder ($21 to win) in race three, Arolla The Dice ($7.80) in race seven and SRC Gold ($3) in race 11. The riding triple gives Badilla 13 wins and places him second in the standings behind leading jockey G.R. Carter who has 19 wins. Badilla, a four-time American Quarter Horse Association Champion Jockey, is in his first full season or racing at Remington Park. Saturday night racing will include the next 11 trials for the $827,000 Remington Park Futurity, with the five fastest 2-year-olds joining the five from Friday night in the final. The first race Saturday night is at 6pm-Central.